If you want a pineapple tart recipe that can rival the best from your aunty, grandaunty, grandmother or great-grandmother (or will at least not be laughed off the table), look no further. 150 tarts and 9 pineapples later, I have finally arrived at one that I am happy with. I have, however, to give credit where credit is due. No recipe could ever have a chance of matching a mother's or grandaunty's, unless it is from a matriarch herself, none other than the grandmother from whom all their recipes originated. My recipe is only decent because it was adapted from such a recipe in the first place. If you are wondering whether this is THE recipe you have been waiting for, let me describe the pineapple tart for you. After all, there are many differing opinions on what constitutes the best pineapple tart - moist jam, caramelized jam, melt-in-the-mouth pastry, firm biscuit-like pastry etc. This recipe yields pineapple jam that is moist and full of natural pineapple flavour. The spices are in such quantity as to complement rather than overshadow the beautiful honeyed taste of the pineapples. More importantly, you won't taste the sourish tang of lemon in this jam. I know that lemon juice is a very common ingredient in pineapple jam recipes, and my fellow baking aficionado C informs me that it is used to supply pectin to the pineapple jam. However, I find that most recipes add them in such quantities as to make the jam slightly sour and rob it of its natural pineapple goodness. The difference in taste is more pronounced than you would think - I could taste the juice in 80% of tarts I have tried this year, both commercial and home-made versions, and they suffered for it next to a pineapple tart unadulterated with lemon juice. The pineapple jam I made set well without the use of lemon juice, so I do think it is not essential especially if there is enough sugar to 'set' the jam. Of course, getting good quality pineapples is essential to making good jam. Many people swear by Sarawak pineapples. I used 'honey' pineapples recommended by my fruit grocer this year, and they were fantastic. Making pineapple jam is the most time-consuming aspect of making pineapple tarts - from peeling to grating to cooking the pineapple to the right consistency. I tried grating the pineapples both by hand as well as with the food processor, and I have to say, the latter method is superior. Apart from saving you from accidentally grating your fingertips, machine-grating also results in pulp with shorter fibrous strands, which is to be desired. Cooking the pineapple jam, which can take anything up to 2 hours, also requires some skill. 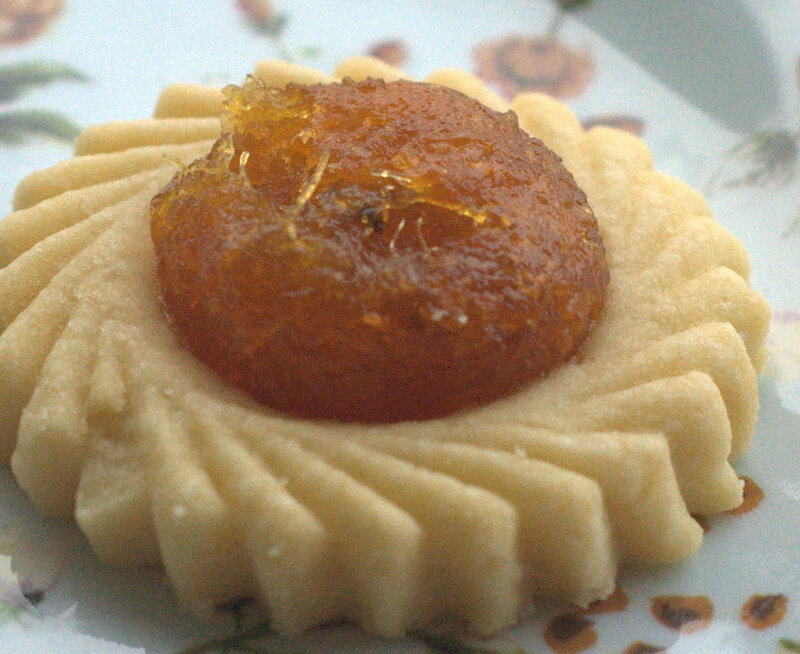 The desired colour is golden yellow, and the jam should no longer be wet but moist. In deciding when to stop, you have to take into account that the jam will dry out further in the oven when the tart is baked. So you are aiming for a degree of moistness that is slightly more than what you would expect in a finished tart. If the jam is too dry, you will get a crispy jam 'shell' on top of your tart (yes, that happened to me), and if it is too moist, your pineapple tarts will get mouldy fast. For the same reason, do not be tempted to cut down on the sugar in the jam too much, as that will also cause your tarts to become mouldy. The jam has to be a little sweeter as the pastry in this recipe is not very sweet. As testament to how good the jam is, take a look at this picture on the right. I had sternly forbidden my kids from snatching pineapple tarts off the cooling rack. So Sugababe 2 slyly thought that I wouldn't miss a thing if she just pinched the jam from a whole row of tarts. You can see what challenging conditions I work under. Now I don't have enough good tarts for gifting (not that my family is complaining). Now we move on to the pastry. In our family, we all differ in opinion as to what makes a good pastry. Grandma likes the pastry firm and biscuit-like, my husband likes it firm but yet tender, and I like it crumbly and melt-in-the mouth. I was striving for the texture I liked, but my husband insisted that he really disliked that crumbly, powdery texture (no doubt melt-in-the-mouth) which always makes him choke. I have to respect the guy who brings home the dough (so to speak), so this recipe achieves a texture that is firm (as in it won't break apart into little bits in your hand) and yet very tender. What we all agree on however, is that the pastry has to be very fine, fragrant, and buttery. For that reason, the rubbed-in dough in this recipe has the highest fat to flour ratio that can be tolerated. The minimum ratio for a shortcrust pastry is half fat to flour, i.e. 50% fat to flour. This recipe has the highest percentage I have seen i.e. 66% fat to flour. It does result in a dough that is slightly trickier to handle, but the results are worth it. The recipe for the pastry is actually very simple. I have seen recipes that call for milk powder to be added, to achieve a 'melt-in-the-mouth' texture, but again, this compromises on the taste. And don't even consider using margarine or shortening, which gives that tell-tale plastic taste to commercial baked pastries. If there is any secret to the pastry at all, it is in the use of salted Golden Churn butter. Or any salted butter of the highest butterfat percentage you can find (no less than 80%). Most of the time, I bake with unsalted butter, but salted butter really makes a difference to this pastry. The other 'secret' is to work the dough as little as possible, since an over-worked dough results in a tough pastry. I used my fingertips to rub the butter into the flour, but my friend C recommends the use of a pastry cutter for this step (so that less heat is transferred), and I think this sounds like a brilliant idea which you should certainly try. 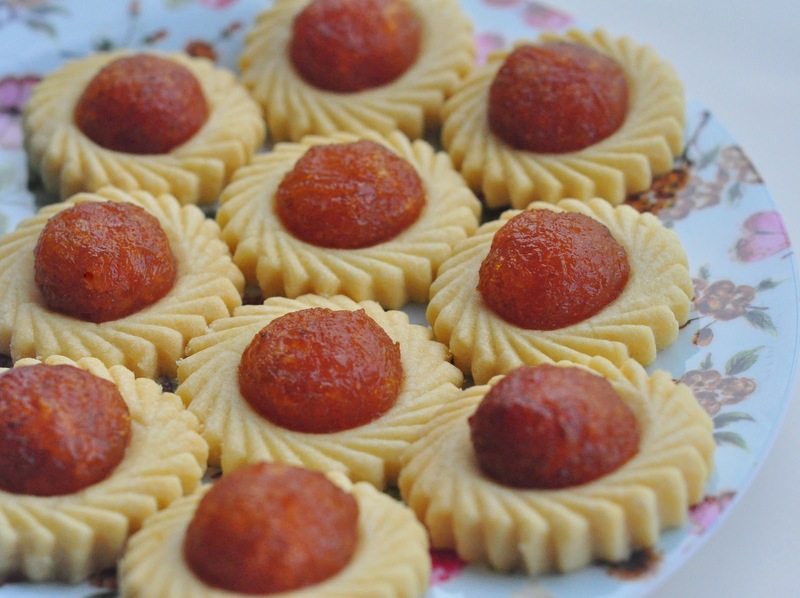 Pineapple tarts are painstakingly laborious to make, but when done well, they are well worth the effort, as nothing that you purchase commercially will ever come close. If you are craving pineapple tarts, I hope this recipe will serve you well this Chinese New Year. If not (and you find something better) then in the Chinese New Year spirit of generosity you must absolutely share it with me ;) From my home to yours, Happy Lunar New Year! 1) Cook all ingredients for pineapple jam in a pot on the stove, ovver low heat. After 30 minutes, remove spices and continue cooking until the juice has dried up but pineapple jam is still moist (not wet). This will take approximately 1 hour. Refrigerate. 2) Sift flours and icing sugar together, twice. Cut butter into small pieces and run into sifted flour.after it is completely rubbed in, add egg and then slowly add in the cold water (only if needed) to get a nice and fairly firm dough. Divide dough into 2 portions, wrap each portion in plastic wrap and chill for 30 minutes. Roll out into 0.5 cm thickness between 2 sheets of plastic and then chill again for another 15 minutes. 3) Meanwhile, roll jam into small balls for easy filling. 4) Take out dough and cut using a pineapple tart mould. Fill with jam. Work in an air-conditioned room. If dough is too soft to work with, flour your hands, the work table and rolling pin, making sure not to add too much flour to the dough or it will become tough. If necessary, flour the tart cutter before cutting each tart, so that the tart removes easily with all its patterns/grooves intact. 5) Arrange tarts on tray lined with baking paper. Chill in fridge for about 10 minutes, then bake at 140C for about 30 minutes. When ready, leave to cool and store. Makes about 50 - 70 tarts depending on the size of the pineapple mould. Yay! So satisfying to 'get' the taste of your choice, even if it's 150 tarts and 9 pineapples later! Thanks for sharing! ERm i actually read your whole post in detail! You are one amazing cook/baker. If only i had the same patience to bake. Wah I was wondering whether I should make pineapple tarts this year, and decided against it because of all the effort involved, but you're seriously making me reconsider. Wish I could have some right now! The recipe I use has just a little lemon juice in it and it doesn't affect the end product. That said, I also use all the pineapple juice instead of just 80% of it. I have also been grating the pineapples by hand but find it very tiring. What kind of machine do you use? Also, your mould is very pretty. Where did you buy it from? Yes grating by hand is extremely laborious, I don't recommend it at all! Use a food processor like I did. I used a Philips model that I borrowed from a friend, but I am sure there are other brands on the market that would do the job just as well. The pineapple tart mould was purchased from Phoon Huat - a baking supplies store that has branches all over the island. inspire me to try and use my "old" never used mould. Like you, i prefer really crumbly pastry, almost 'powdery'. What would you recommend as a change to your recipe above to achieve that? Recipes that include milk powder tend to turn out a more 'powdery' pastry. I have not tried adjusting this recipe to include milk powder but you could try looking for one with that. Tried this recipie today. Turned out crispy and not buttery at all. Also upped the sugar to 4Tbsp as 2 Tbsp didn't seem right. I think using only egg yolk would give a more tender texture rather than half of a whole egg. Sorry that your pastry didn't turn out. Our family has baked with this recipe for years and I have never had problems with it. That said, the pastry is essentially a shortcrust pastry. Eggs are optional (some recipes don't include them at all, relying only on a little iced water to bind the dough together), and so is sugar (savory pastries sometimes do not include sugar, only a little salt). The sugar amount of 2 tbsp is correct, and kept minimal as the pineapple topping is already very sweet. You may of course increase it to taste (as you have done) but that would result overall in a sweeter tart. Proper handling of the shortcrust dough is essential and I would say 99% of the issues with texture (e.g. pastry being too hard, crispy or tough) have to do with the fact that the dough is overworked. Our hot and humid weather certainly poses a challenge to turning out a good pastry. I have found that using a food processor to cut the butter into the flour is an effective way as it doesn't give time for the butter to melt. can i do open-faced with this pastry recipe? when using a food processor to cut the butter into the flour, do you need to use only the pulse mode? Tested 2 other recipes and finally found the recipe that I am looking for at your site. I like that your pastry, firmness is just rightr, very suitable for open faced tarts. Thank you so much. hi. how do i make my pineapple tarts more moist? it as too dry the first time. Try baking it for a shorter time? It could have been over-baked, especially if you notice that the pastry is a darker colour (it should still remain a light colour). That said however I do find that these tarts tend to get more moist after they are stored, possibly because of the moisture from the pineapple filling.